1.In large skillet, heat 1 tablespoon oil over medium-high heat. Add onion and cook 8 to 10 minutes or until golden brown, stirring occasionally; add garlic and cook 1 minute. Add sausage and cook 8 to 10 minutes or until browned, stirring occasionally. Add spinach and cook 4 to 5 minutes or until wilted, stirring occasionally. Add chives, 1/2 teaspoon each salt and pepper, and thyme, and cook 30 seconds; remove from heat and stir in breadcrumbs and cheese. Let stand 20 minutes or until cooled to room temperature. Makes about 1-1/2 cups. 2.Line work surface with plastic wrap; place turkey breast on plastic wrap and cover with second piece of plastic wrap. With flat end of meat mallet, pound turkey to flatten to 1/4-inch thick (about 12 x 9 inches); remove top plastic wrap. With long edge of turkey towards you, leaving a 2-inch border on bottom edge, place filling lengthwise in about a 2-inch row. Starting from long end, tightly roll turkey around filling to enclose, using bottom plastic wrap to help roll and shape into a log. Tightly wrap turkey in same plastic wrap; freeze 1 hour or refrigerate at least 2 hours. 3.Preheat oven to 450°. Sprinkle outside of turkey with remaining 1 teaspoon each salt and pepper. In oven-safe large skillet or roasting pan, heat remaining 3 tablespoons oil over medium-high heat. Add turkey and sear 1 minute per side or until outside is browned. 4.Roast turkey 22 to 25 minutes or until internal temperature reaches 160°. (Internal temperature will rise 5 to 10° upon standing.) Let stand 10 minutes before slicing. Cooking Clues Sausage-spinach filling can be prepared, covered and refrigerated up to 2 days in advance. 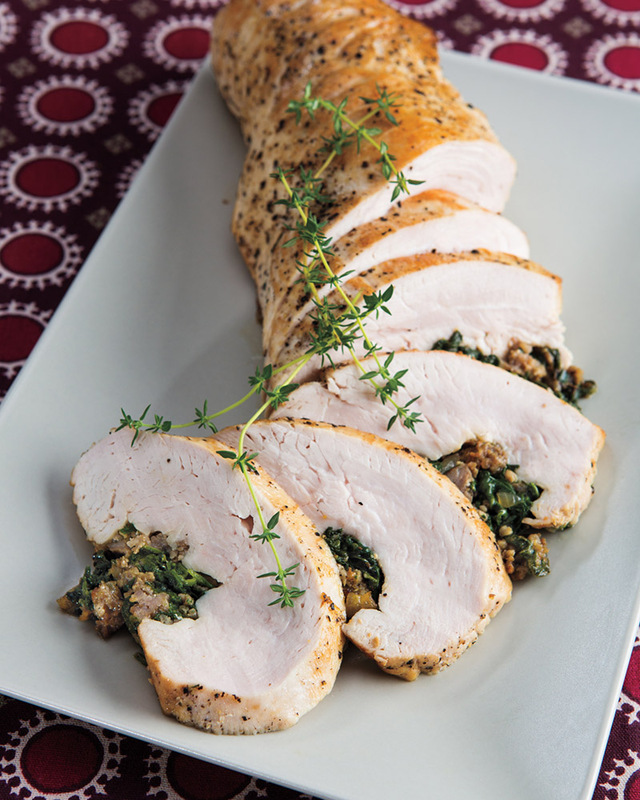 Stuffed turkey can be refrigerated up to 1 day in advance.